Step 1 Combine the flour, three-fourths teaspoon salt and black pepper. Add the two-thirds cup of butter pieces and toss to coat. Use a pastry blender or your hands to work the butter into the dry ingredients until small pieces of butter remain and the flour-butter mixture resembles coarse-ground meal with no large pieces of butter visible. Step 2 Sprinkle the ice water over the flour mixture and stir with a fork until the dough holds together and forms a ball. On a lightly floured surface, cut the dough in half and shape into two equal disks. Wrap the dough in plastic wrap and refrigerate until firm, about 1 hour. Step 3In a large bowl, toss together the nectarines, blackberries and lemon juice. You should have about 4 cups of fruit. Let stand while rolling out the dough. Step 4Heat the oven to 400 degrees. Remove the dough from the refrigerator and allow it to stand 10 to 15 minutes. Roll out half of the dough on a lightly floured surface into a 12-inch circle about one-eighth-inch thick. Roll the dough around the rolling pin. Carefully lift the dough onto a 9-inch pie plate and gently press it into the bottom and up the sides, leaving excess dough hanging over the edge. Step 5Roll out the second round of dough into a rectangle about 13 by 10 inches and one-fourth-inch thick. Cut the dough lengthwise into eight strips about 1-inch-wide. Step 6In a bowl, combine the sugar, cornstarch and remaining one-fourth teaspoon salt. Pour the mixture over the fruit, stirring to coat. Then stir in the corn syrup. Fill the pie shell with the fruit and juices. Sprinkle over the remaining 1 tablespoon cut-up butter. Step 7Lay half the strips of dough over the top of the pie. Lay the remaining strips of dough diagonally over the top of the first strips. Or weave the strips by laying 4 strips over the top of the pie. Fold the first and third strips back (about three-fourths of the way across the pie), then place a strip across the second and fourth strips. Unfold the first and third strips over the perpendicular strip. Fold the second and fourth strips back; add another strip across the first and third strips. Now unfold the second and fourth strips. Repeat with 2 more strips of dough, working your way across the pie. Step 8Pinch the edges of the dough together and fold the edges under to fit the pie dish. Pressing the rim of the dough between two fingers, flute the edges. Brush the crust with the beaten egg and sprinkle with Demerara sugar. Place the pie on a baking sheet and bake for about 50 to 55 minutes until the pie is well-browned and bubbly. Let the pie cool to warm before serving. In Recipes-list.com we have selected the most viewed recipes from category - Best recipes Desserts . Enjoy the best recipes specially selected for you! 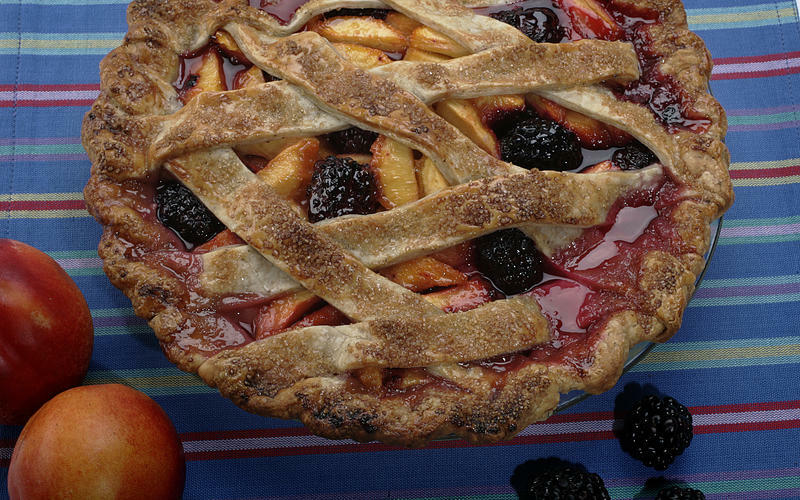 Nectarine-berry pie with black pepper crust is the right choice that will satisfy all your claims.